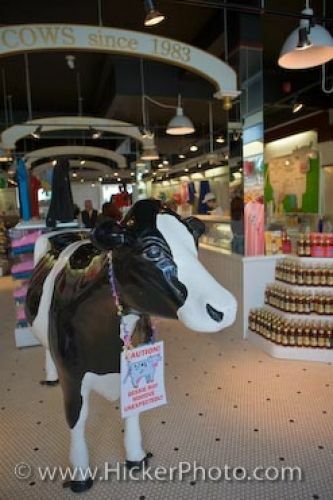 A statue of a shiny brown and white cow stands at the shop called Cows in Niagara on the Lake in Ontario, Canada. Cows is known throughout Canada for its outstanding ice-cream which was founded in 1983 in Prince Edward Island, Canada. What started out as a simple family recipe has become very well known throughout Canada and there are 7 stores found in Prince Edward Island with other locations in Halifax, Banff, Whistler and Niagara-on-the-Lake. Cows has also branched out into the United States of America with a shop located in Park City in Utah, USA. In the stores, at all the locations, Cows also sells a wide assortment of clothing and numerous other fun products, but the ice-cream remains their first priority. Picture of a cow statue at the ice-cream shop called Cows in Niagara-on-the-Lake, Ontario. Statue of a cow at Cows, a shop in Niagara-on-the-Lake, Ontario, Canada.